In Metasploit Framework , auxiliary modules are the built-in modules which can perform certain tasks like - scanning target with scanner auxiliary module in BACKTRACK 5 . 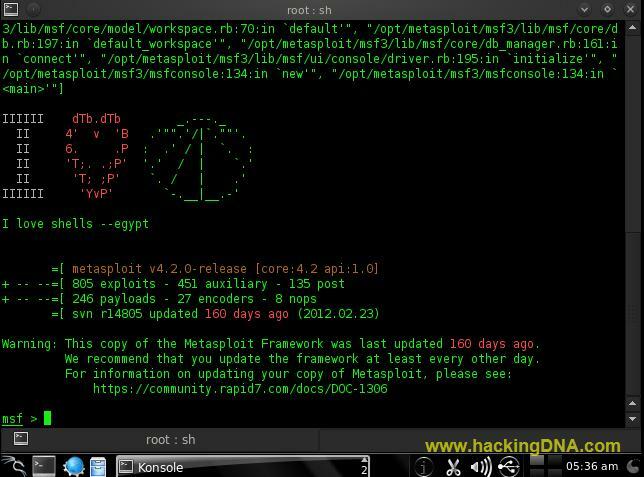 There are more than 360 plus different modules present in the Metasploit Framework . In this tutorial , I have used two Operating System virtually on VmWare Workstation . Lets search for port scanning module that are available in the framework . Command Used to search for portscan modules is : search portscan . After searching , it shows different maching modules related to portscan. Now lets start with the syn scan, to do that we have to activate the module . Remember to activate module , the use command is used . Now we have to check what parameters are required , for that we have to use the ' show command '. Now set the 'INTERFACE' and 'RHOSTS' . See the below image to see how to set INTERFACE AND RHOSTS . Use show options command again to see all the options . Now write run and press enter to start the scanning . The below image show you the result of TCP SYN scan . WE USE THE SCANNER AUXILIARY MODULE. AFTER ACTIVATING , WE SET ALL THE PARAMETERS . AT LAST WE RUN THE MODULE AND GET THE RESULT .